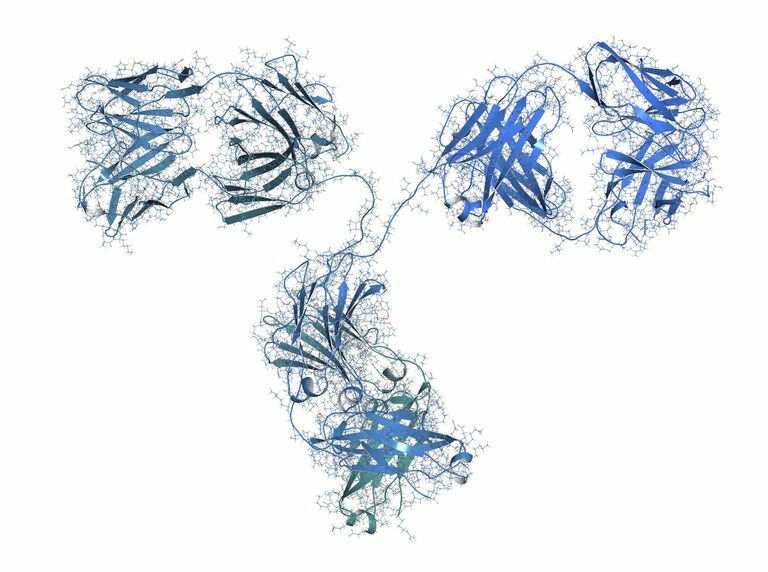 What is a monoclonal antibody? How do monoclonal antibodies work as a treatment for rheumatoid arthritis and related conditions? Which of the biologic drugs are monoclonal antibodies? Are more in development? To begin to answer these questions, it helps to understand what an antibody is. Antibodies are proteins that are generated by the immune system, specifically the white blood cells. They circulate in the blood and attach to foreign proteins called antigens in order to destroy or neutralize them. For example, when you are exposed to a virus, your body will produce antibodies to help rid your system of the infection. Monoclonal antibodies are laboratory-produced substances that can locate and bind to specific molecules, such as tumor necrosis factor (TNF), a protein involved in causing the inflammation and damage of rheumatoid arthritis. Remicade, which is administered by intravenous infusion, uses a combination of human and mouse proteins to create a hybrid protein that is known as a chimeric monoclonal antibody. Humira, which is administered by injection, is produced from fully human proteins. Simponi is a human monoclonal antibody. It is available as injection or infusion. Producing man-made proteins is an intricate process that involves placing cells in large stainless steel vats filled with nutrients to produce the specified protein. It is extensively tested to ensure purity before it is ready for patient use. Another monoclonal protein approved for the treatment of rheumatoid arthritis is Rituxan. Like Remicade, it is a chimeric mouse/human monoclonal antibody that is given by intravenous infusion. Unlike Remicade, it attacks the B cells as opposed to TNF. Several new monoclonal antibodies are in the developmental stage to treat rheumatoid arthritis and other conditions.